Acceptance of Interracial Marriage Growing in U.S. Brandy (left) and Chris (right) Barnes were profiled in First Kiss to Lasting Bliss. 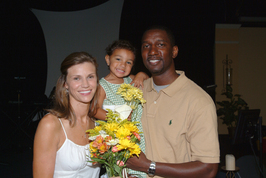 Pictured here with their daughter, Summer, in 2007, when they renewed their wedding vows. Today’s topic is an important marital trend here in the states: The number of interracial marriages in the U.S. is on the rise, and acceptance of these marriages is also increasing. CNN reported on a new PEW Study that shows approximately 15 percent of new marriages in the U.S. in 2010 were between spouses of different races or ethnicities. This is double the number from 1980. As a percentage of all marriages, interracial marriages (also called intermarriages) accounted for 8.4 percent in 2010. About 43 percent of Americans said they believe more intermarriages is a change for the better within society, while only 10 percent believe it is a change for the worse. More than one-third of American adults reported an immediate family member of close relative is married to someone of a different race. And 63 percent said they would have no problem with a family member marrying outside their racial or ethnic group. This is in stark contrast to the 1986 study that reported only one-third of the public thought intermarriages were acceptable for everyone. This issue has some personal significance to me, since my husband is half Chinese (and my children are, therefore, one-quarter Chinese). Thankfully, we haven’t experienced any overt negative comments or hostility during our marriage based on ethnicities. In fact, people tend to be very welcoming of that fact. However, I interviewed an interracial couple—Chris and Brandy Barnes—for my book, First Kiss to Lasting Bliss: Hope & Inspiration for Your Marriage, who faced a great deal of hostility from family, friends, and sometimes strangers. As an African-American man and a fair-skinned, blond Caucasian living in North Carolina, the couple faced criticism from friends prior to their marriage, even though they dated through college and grad school. They also faced a lack of acceptance from his family, which caused stress and conflict in the marriage. They worked through the conflicts and have had to distance themselves from his family as a means of creating boundaries around their new family. They are a happy family, and they have also created standard positive responses they give to individuals (mostly Black women) who make negative comments in public about them or their biracial daughter. Living in the south may contribute to the racism they sometimes see. Despite negative attitudes that still exit, we have come a long way in this country, where forty-five years ago, the U.S. Supreme Court struck down a ban in interracial marriages. The PEW Study shows the number of intermarriages and the approval of such marriages vary by region, educational levels and ethnicities. For instance, in Western states, one in five people married someone of a different race or ethnicity between 2008 and 2010. In the south, that number drops to 14 percent. Even lower numbers are reported in the Northeast (13 percent) and the Midwest (11 percent). Hawaii had the most intermarriages with 42 percent. Higher educational status was sometimes linked to higher rates of intermarriages, with White/Asian unions among the most educated and the highest median combined annual earnings. The study is primarily based on the PEW Center’s analysis of data from the U.S. Census Bureau’s American Community Service in 2008-2010 and on three nationwide telephone surveys. For more details, see the CNN report. If you want to read more about Chris and Brandy’s story and how they created their happily ever after, check out the book here. This entry was posted in Books, Family, Happiness, Love, Marriage, Relationships, Uncategorized and tagged demographic trends in U.S., Family, intermarriage, interracial families, interracial marriage, interracial relationships, Love, love and race, Marriage, marriage trends, race and marriage, Relationships. Bookmark the permalink. It’s disappointing that the couple you mention encounter people that make negative comments towards them, but it’s great that they handle it with positivity. It’s good that acceptance for interracial marriages is growing. Hopefully sometime in the future there will be no prejudice or discrimination towards mixed race couples/families. That’s the way it should be. I completely agree. Their ability to remain positive, especially to frame all responses in a positive manner for their daughter, speaks volumes. Thanks for your note of support. I’m black and my fiance is white, and we’ve both had our share of negative comments. I don’t allow them to bother me because after a while, you become immune to the negativity. Plus, we have a plethora of family and friends who are supportive, and that’s what matters to us. I’m glad the negativity no longer bothers you. Congrats on your engagement and for having friends and family who support you! I think the more we intermarry, the more elevated the society will become. Breaking down racial and ethnic barriers is a pathway to progress. As our racial identities recede into the background, we can more easily focus on what we have in common. The more we focus on what we have in common, the more we can expand our sympathies, and focus our concern on others, where it can do the most good.